Every once in a while I get the urge play with realism. Laurie she likes this one because pansies were her Mom's favorite flower. As she often does, though, she wishes I had made the background and frame in a different color. By the way, this is one of the paintings that Laurie chose to create the Christmas ornaments. I love the ornaments that she made but we both think this design is pretty spectacular, too. Laurie says she's already picturing one of the prints on the wall of our new house since she is totally in love with purple. You can have it for your home, too. Just click on the link below. So while I've been busy creating the next masterpiece, Laurie has again been creating amazing and fun products using my designs. "Christmas is coming," she tells me! Already? Well, apparently some people plan these things early! 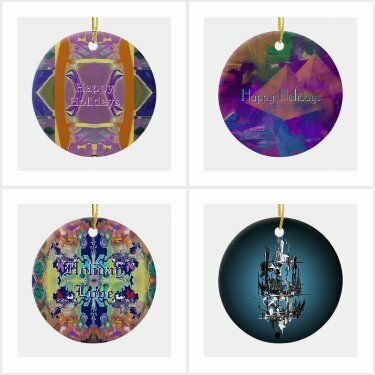 So here are just a few of the totally cool abstract ornaments she has created in my store, using some of the abstracts I've designed which are her favorites. Click on the graphic below and it will take you to a collection of more ornaments in this series. Laurie has been busy lately creating dozens of these new ​cross body tote bags. 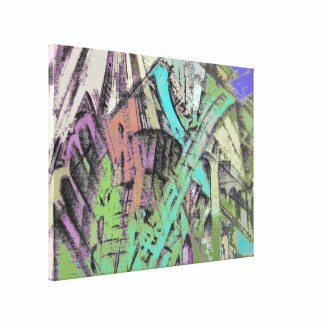 They're all available in two sizes and styles and each one features a design based on one of my abstract paintings. Laurie says they will be great gifts for women so we'll see if they are the next hot item featuring my art. I've been doing a lot of designing lately. ​I had fun with the colors and curves of this one. You may or may not agree, but Laurie just informed me that this recent painting is my best of the year! Today I will show a grouping of paintings and some words about the painting. All four of these digital paintings have something in common, the use of Layering and Opacity (how transparent). It's been a long time. I have created a lot of digital paintings in the last year and a half! Seems that I'm a better painter then a writer. 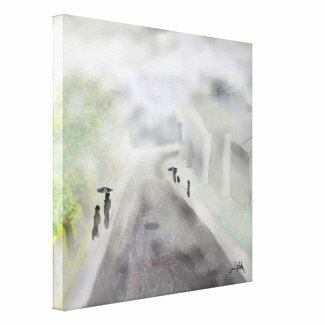 So right now I'm going to look at all I've painted and how best to show them on this blog. Most of what I will write will be about my painting and painting in general. If you have any questions about me, my work, art, please ask me when you write in the comments section.